Eve Dallas and her partner, Peabody, are following up on a brutal, senseless crime - an elderly grocery owner killed by three stoned punks for nothing more than kicks and snacks. And for the first time, Peabody is primary detective on the case, which means she has to get used to a new level of authority and responsibility. Good thing she learned the ropes from a master like Eve. But after rounding up the perps, Peabody stumbles upon a much trickier situation. Determined to start working out as hard as she grills suspects, she chooses to do it at the old, rarely-used gym at Central. After a grueling workout, she squeezes into one of the narrow shower stalls, happy to have the place to herself. Just after she shuts the water off, the gym door clatters open - and while she cringes inside the stall, trying not to make a sound, Peabody overhears two fellow officers, Garnet and Oberman, arguing. References are made to delivering product, and a house in the islands, and someone named Keener who's supposed to look like an OD. It doesn't take long for a naked and vulnerable Peabody to realize that both officers are crooked - guilty not just of corruption but of murder as well. Fortunately, the two clear out of the locker room without realizing there was a witness. Eve Dallas may have trained Peabody well - but this is too dangerous for one person to take on alone. 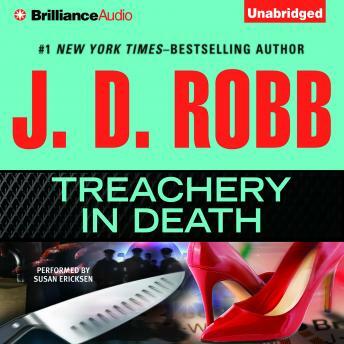 Now Peabody, Eve, and her husband, Roarke, must try to get the hard evidence they need to bring the dirty cops down - knowing all the while that the two have already killed to keep their secret, and are no doubt willing to do it again. This one is my second fav of the series. I love the way Eve is not only developing in her relationship with Roarke but also with her squad members and associates. I also love how Peabody is growing skill wise. The narrator does an outstanding job with the emotional changes with each character. Love, love, love!! !